This is the saddest thing you will ever watch. If there’s a more depressing video on the Internet, I have yet to see it. 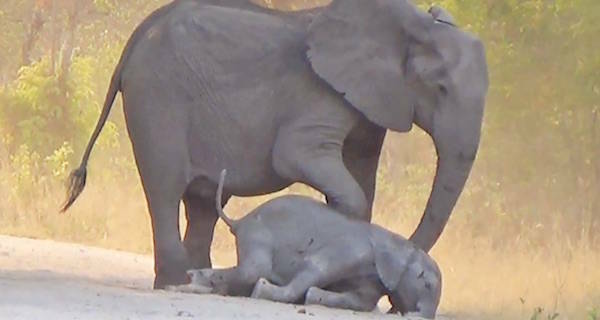 Recent footage from Zimbabwe’s Hwange National Park shows the devastating aftermath of a baby elephant being hit by a speeding car. “It was emotionally draining to watch and I never want to have to experience such a moment again,” Heidi Haas, who filmed the scene after coming upon the already-injured elephant, told Latest Sightings. Haas watched as the entire elephant herd tried to help the baby, who had had its legs and back broken in the accident. Rangers were called in immediately, but they were too late. Watching the video, it’s clear that the herd is distressed. The group of a dozen or so tries to prop the baby up on its broken legs as it collapses again and again. The adults make desperate cries as they gently nudge the baby with their feet. When it becomes clear that nothing will work, the mom and dad stay close, nuzzling the elephant with their trunks in its last few minutes. Elephants are one of the few species, besides humans, who seem to mourn their dead. They’ve been observed having funeral-like gatherings and are clearly distraught when they loose a family or community member. “The fact that they interact and have behavioral interactions with their dead in a form that is not explainable in any simple, evolutionary context speaks to the deeper emotional lives of elephants that we can’t easily study,” biologist George Wittemeyer, told National Geographic. Even long after the bodies decompose, elephants have been shown to react strongly to skulls of their own species. Scientists are also intrigued by how these animals seem to get upset by the deaths of elephants they’re not even related to, indicating a complex social understanding. In this video, for example, the entire herd works to get the baby to the side of the road. “My last words to everyone who visits these magnificent parks all over the world, please take care and don’t over speed as the loss of such a beautiful life as in this case is absolutely unnecessary!” Haas said after the incident. As a serial speeder, even I might have to slow down after watching this video. Just on the off chance that a baby elephant is wandering around New York. Next, watch a happier video of an elephant stranded nine miles at sea getting rescued by the Sri Lankan Navy. Then, check out these first-ever photos of a wild lioness nursing an orphaned baby leopard.